On January 26, 2009, with the placement of the last piece of equipment, NIF began the transition from a construction project to an experimental facility, ready to ramp up to full steam ahead. No one had a closer perspective on this milestone than subsystem manager and electrical safety inspector John Hollis. 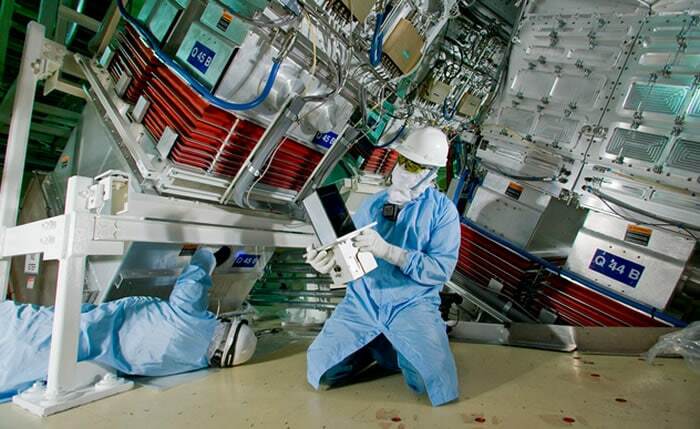 Donning a hardhat, laser goggles, and cleanroom attire, he attached NIF’s last line replaceable unit (LRU) to a Final Optics Assembly (FOA) inside the Target Bay. An LRU is a self-contained piece of equipment that contains multiple components and can be assembled, tested off-line, and quickly and easily installed as a unit. Being plug-and-play and interchangeable between beamlines helps reduce cost and downtime when maintenance is required. Altogether, NIF had 6,206 LRUs to install. Along with the thousands of LRUs, more than 3,100 pieces of amplifier glass, 8,000 large optics, and 30,000 small optics also were installed. Still, all these were just a fraction of the total number of components needed to make up NIF’s intricate systems. From 2003 to 2004, as construction raced forward, the NIF Early Light (NEL) campaign exercised one quad of beams. Finally in September 2010, the years of tireless construction and precision planning paid off when NIF made its first integrated ignition shot using all 192 beams. Coming to NIF was a smooth transition for him because of many factors, not the least of which is that like a carrier, NIF is a gigantic and complex machine. In high school, Hollis got into auto mechanics and motorcycles. After graduating he started skydiving, which propelled his interest in aviation. Joining the Navy as an aviation electronics technician was a natural fit for his hands-on nature. Though someone who seems always to sit up straight, Hollis rises in his seat a little more when talking about his military days. He especially enjoys trading stories with the many other veterans working at NIF and throughout the Lab, even if they’re from a different branch of service. Hollis first arrived at NIF in August 1997, after it had just passed the 33% design review. 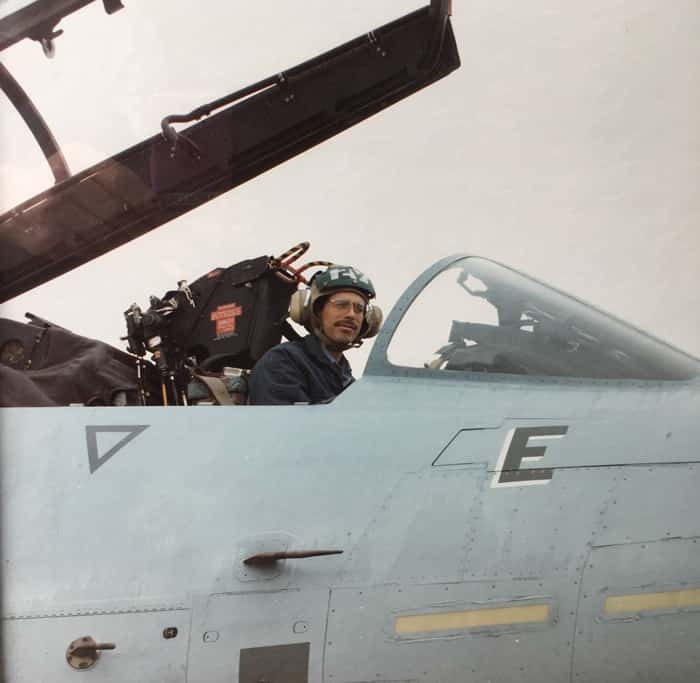 Applying his fiber-optic skills, attention to detail, comfort in fast-paced environments, and focus on fulfilling the mission, he helped design, build, test, and deploy assemblies for the main laser system’s auto alignment. He went on to build other parts of the main laser system and then assisted in building out the Target Bay. That was when he installed that final LRU, signifying the shift in mission from construction to operations. Working half in operations and half in engineering, Hollis now manages some of the systems that he designed and built more than 10 years ago, which have been running 24/7 since then. 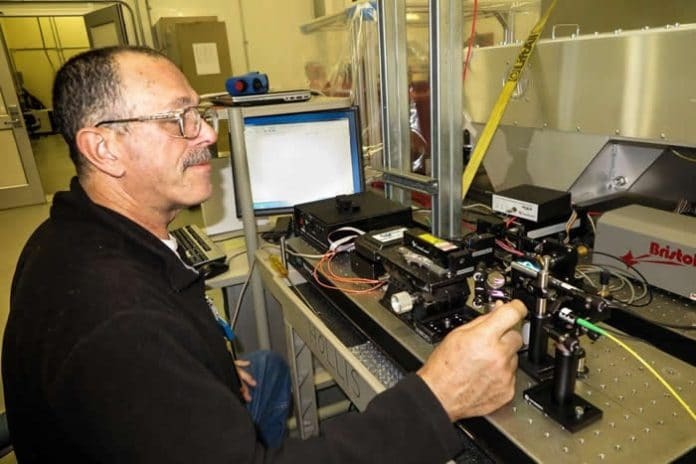 He supports the main laser system’s LM1/LM3 (laser mirror 1/laser mirror 3) light source launchers—assemblies that inject light into the laser cavity of each beamline to provide a reference for the beam center and to provide light to pre-align the beams before a shot. He also covers the alignment lasers that light those fiber-optic systems. In the switchyards, he also maintains the Edge Illumination System, which shines laser light on the optics that are stacked in the Integrated Optics Modules (IOMs) within each of the FOAs attached directly to the Target Chamber. Peering into one beamline at a time, the Final Optics Damage Inspection System, a camera inserted into the center of the Target Chamber, focuses on each of those optics. Lighting up the optics from the side allows for easier detection of damage. Hollis feels having access to the scientists and engineers who helped design the parts and systems offers invaluable insight. “It is always great to be able to talk with the person who designed something and ask, ‘What are you thinking here? How is this supposed to work?’ As opposed to being at the mercy of only a user manual,” he says. When not working on some assembly for NIF, Hollis often can be found working on aircraft. Only this time, he is also the pilot. After making 600 skydives, he felt comfortable enough to add a small engine to the mix. 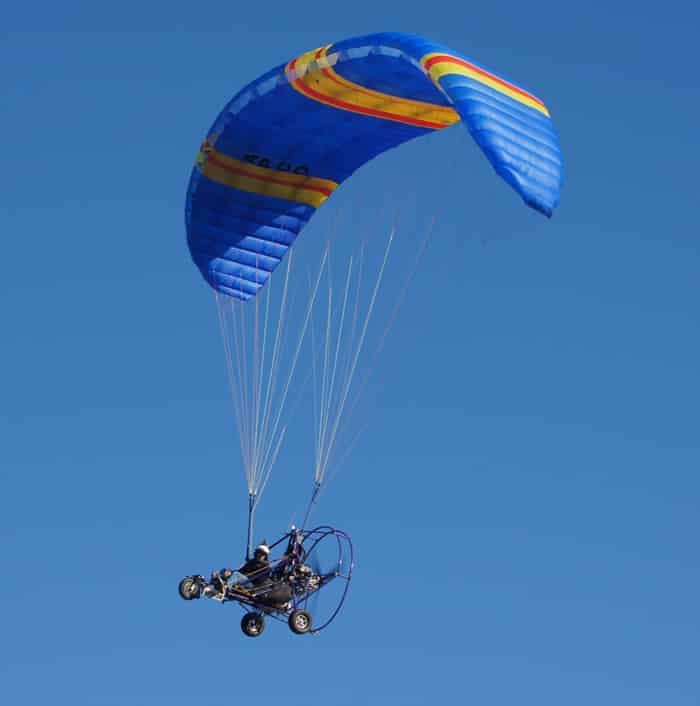 In 2007, Hollis started flying a powered-parachute ultralight. Mounted to the fuselage are the engine, wheels, and a parachute used as the wing. And in F-14 fashion, he also owns a two-seater version. I am not impressed: a man that uses his extraordinary skills to make weapons for the anglozionist empire is so wrong. It empowers the enemy of the rest of the humanity. I would never, ever, ever do, or build or create or assemble something that could used directly as a weapon by such an evil entity. There are multiple ways to become an opposition to evil. You just have to put to practice moral and/or ethical values. A man that dreams and invents, does! Thank you! Glad he’s been on our team, what a resource!